Commemorate the hard work you put in to run a marathon with this classy silver charm. 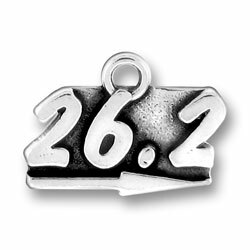 This 26.2 Marathon Charm measures 3/4" x 3/4" and is made of lead-free .925 sterling silver. It includes a jump ring to attach the charm to your bracelet (not pictured). Add this charm to your favorite charm bracelet or slip it on to a chain to wear as a necklace. Great gift for someone who just ran their first marathon or to treat yourself for the months of training for a marathon.